A process used to reconstitute waste consisting of limestone building blocks or excavated limestone material into a suitable building/decorative material. The process requires the collection of waste limestone, building blocks or excavated waste, processing the waste by carrying out crushing and grading of the waste limestone, then further processing the waste aggregate into a suitably graded powder. The powder is then converted into a workable paste which can be moulded. The resulting reconstituted stone material is a hard, dense limestone material which can be cut, shaped and finished in a similar manner to natural limestone. There is currently no solution for recycling waste limestone and concrete in which such great benefits are obtained. The recycled material performs better than the parent material, particularly with respect to strength, water resistance and weathering. The process can be used to turn a portion of construction industry waste into revenue-generating recycled building materials. According to the European Commission, “Construction and demolition waste is one of the heaviest and most voluminous waste streams generated in the EU. It accounts for approximately 25% - 30% of all waste generated in the EU”. Of that 40-80% is concrete and masonry. The European Commission has issued a policy stating that 70% of construction and demolition waste must be recycled by 2020. Given that waste is used as a raw material, the resulting products are likely to do well in publicly procured projects or in projects seeking LEED certification, or similar. The process can be used to make building materials such as building blocks, bricks, cladding, tiles and decorative materials. Given that the process moulds resulting products, niche products can be devised which contain water repellents, fire retardants, colour, fungicides, reinforcement and so on. The process has been proven and various tests have been carried out to quantify compressive strength, shear strength, durability, and so on. 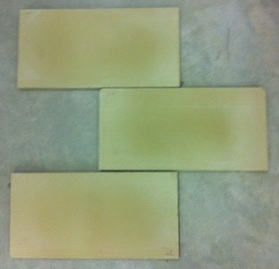 A cladding/tile prototype (seen below) has been made in the lab. Further work is being carried out to optimise the mix. Patent pending. A patent application (application no. 1406481.0) entitled "Masonry composite materials and processes for their preparation" was submitted by the University of Malta in the United Kingdom in April 2014 with good prospects to get granted. This was converted to a PCT application in April 2015 and has now entered national phase through a European application. We are looking for potential licencees and collaborators to support development of products and scale-up for manufacturing of such products. The ideal partner would have experience in manufacturing construction materials.